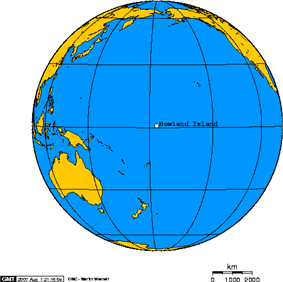 Howland Island is an uninhabited United States. Geographically, together with Baker Island it forms part of the Phoenix Islands. For statistical purposes, Howland is grouped as one of the United States Minor Outlying Islands. Howland is located at . It covers , with of coastline. The island has an elongated plantain-shape on a north-south axis. There is no lagoon. Howland Island National Wildlife Refuge consists of the island and the surrounding of submerged land. The island is managed by the U.S. 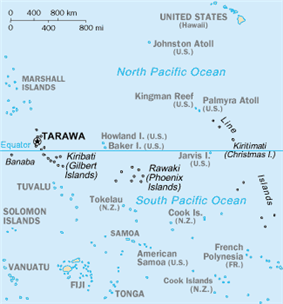 Fish and Wildlife Service as an insular area under the U.S. Department of the Interior and is part of the Pacific Remote Islands Marine National Monument. There are no natural fresh water resources. The landscape features scattered grasses along with prostrate vines and low-growing pisonia trees and shrubs. A 1942 eyewitness description spoke of "a low grove of dead and decaying kou trees" on a very shallow hill at the island's center. 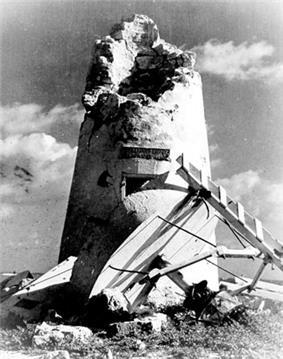 In 2000, a visitor accompanying a scientific expedition reported seeing "a flat bulldozed plain of coral sand, without a single tree" and some traces of building ruins. Howland is primarily a nesting, roosting and foraging habitat for seabirds, shorebirds and marine wildlife. The U.S. claims an Exclusive Economic Zone of and a territorial sea of around the island. Sparse remnants of trails and other artifacts indicate a sporadic early Polynesian presence. A canoe, a blue bead, pieces of bamboo, and other relics of early settlers have been found. [N 1] The island's prehistoric settlement may have begun about 1000 BC when eastern Melanesians traveled north and may have extended down to Rawaki, Kanton, Manra and Orona of the Phoenix Islands, 500 to 700 km southeast. K.P. Emery, an ethnologist for Honolulu's Bernice P. Bishop Museum, indicated that settlers on Manra Island were apparently of two distinct groups, one Polynesian and the other Micronesian, hence the same might have been true on Howland Island, though no proof of this has been found. The American Guano Company established claims in respect to Guano Islands Act of 1856. However when the United States Guano Company dispatched a vessel in 1859 to mine the guano they found that Howland Island was already occupied by men sent there by the American Guano Company. The companies ended up in New York state court,[N 2] with the American Guano Company arguing that United States Guano Company had in effect abandoned the island, since the continual possession and actual occupation required for ownership by the Guano Islands Act did not occur. The end result was that both companies were allowed to mine the guano deposits, which were substantially depleted by October 1878. In the late 19th Century there were British claims on the island, as well as attempts at setting up mining. John T. Arundel and Company, a British firm using laborers from the Cook Islands and Niue, occupied the island from 1886 to 1891. In 1935, a brief attempt at colonization was made, part of THE Baker, Howland and Jarvis Colonization Scheme administered by the Department of Commerce to establish a permanent U.S. presence on the equatorial Line Islands. It began with a rotating group of four alumni and students from the Kamehameha School for Boys, a private school in Honolulu. Although the recruits had signed on as part of a scientific expedition and expected to spend their three-month assignment collecting botanical and biological samples, once out to sea they were told, "Your names will go down in history" and that the islands would become "famous air bases in a route that will connect Australia with California". 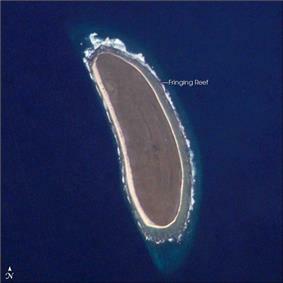 nearby Baker Island, Jarvis Island and two other islands.